Newborn fever is potentially serious for your baby. Fevers can be the first sign of serious infection, or may merely be a symptom of a mild cold. There are several different types of thermometers to measure fevers. The most accurate way to measure your baby’s temperature is with a digital rectal thermometer. 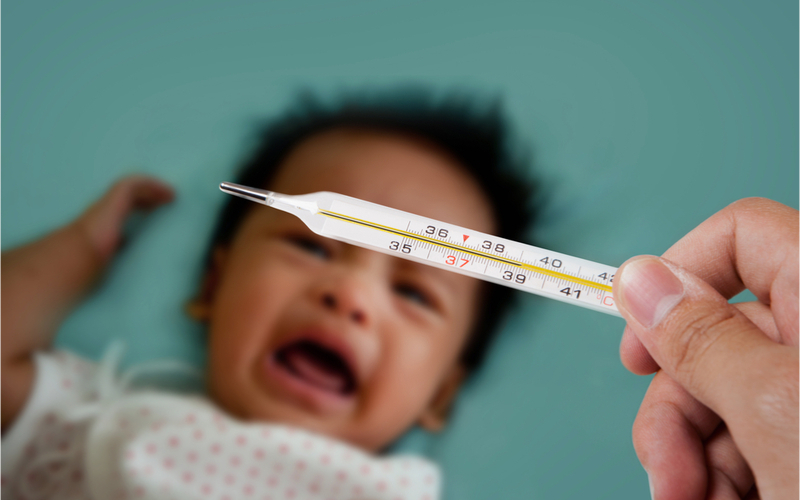 If the thermometer reads 100.4 or higher, your baby has a fever and should be seen by his doctor. If the thermometer reads 100.3 or less, but your child is acting sick, then call your doctor. If you measure the baby’s temperature with a thermometer in the mouth or ear and the reading is 99.5 or higher, please double check it rectally as instructed in the link “How to Take a Child’s Temperature” below.